These photos are from a movie called “Country Justice”, filmed in Tazewell Virginia. (For a while it was known as “Coal Miner’s Grand-daughter”.) This was George C. Scott’s last movie. 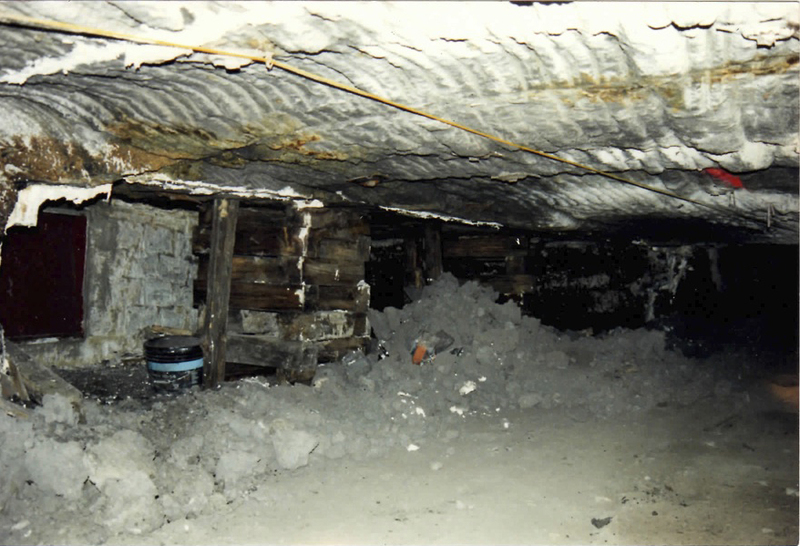 I was Scenic Charge, responsible for interviewing miners and collecting reference photos inside a working West Virginia low seam coal mine. This required traveling two miles inside the mountain, the ceiling never more than four feet above the floor. The miners spent their working lives crouched, crawling and shifting. 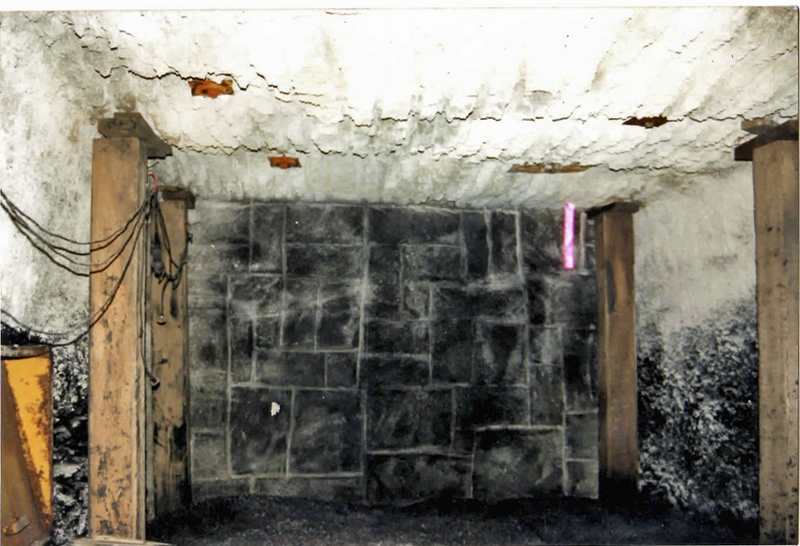 I directed a crew of scenic artists and foam carvers in making a modified replication of what I saw in the mine. Our work was above ground, and light, compared to theirs. 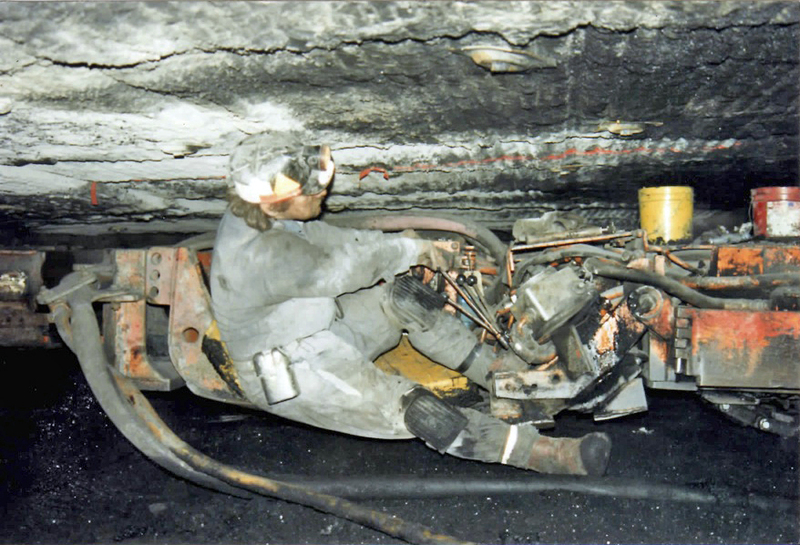 A miner on his mining machine. The grinding head is in the nose of the machine, about fifteen feet in front of the miner. 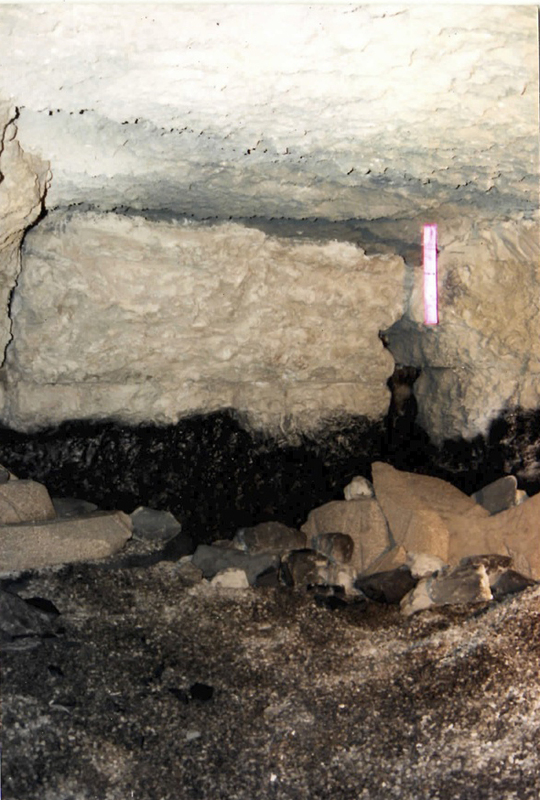 The miners follow the coal seam, leaving pillars of coal to hold up the ceiling. Once the seam is exhausted the miners back out, collapsing the pillars and collecting the coal as they go. Should the ceiling collapse on the miner, rescuers will dig in and grapple onto the back of the drilling machine and pull it out. It will quickly return to service, controlled, very likely, by another driver. As you can see there is no overhead protection for the man. 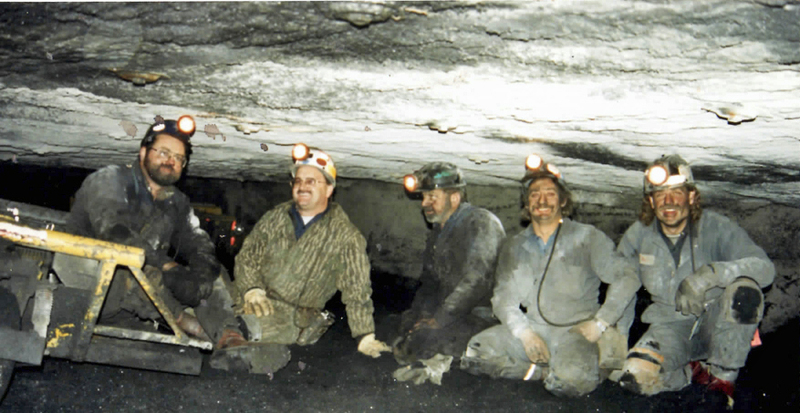 This photo shows the actual West Virginia miners. Despite the working conditions they were a hardy, cheerful lot. 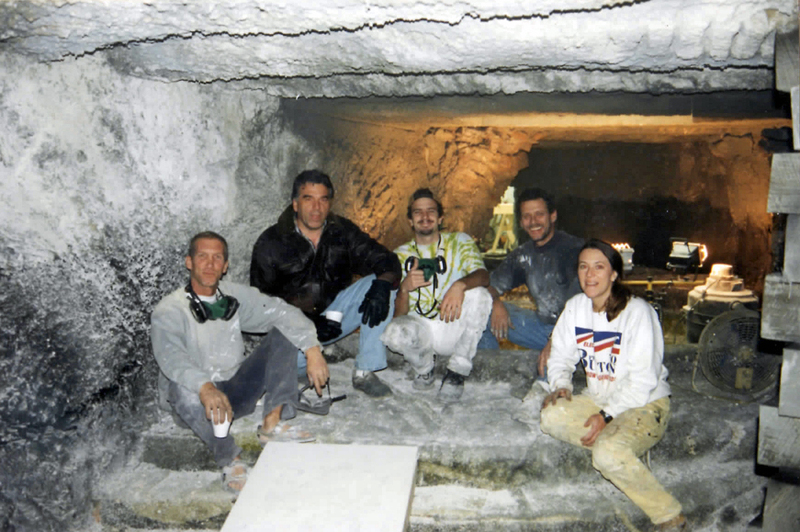 A crew photo in the re-imagined mine. Taswell Virginia had one motel at the time. Crew (and leads who wished) were housed with mining families. We were well fed and cared for. The local and family histories we heard did give us cause for reflection; me anyway. Generations of men worked the mines and everyone had lost someone to accident, black-lung, cave-ins, methane explosions which turned mine shafts into canon barrels, shooting miners across the valley to crash into the opposing mountain. We learned of strikes and shut-outs, shoot-outs and union-busting; the times and the economic hardships; the lack of choices for the young people. But there were also music, cheer, laughter and comfort to be shared. People are people, where ever we go. I’m glad I took this gig. The set rigged for cave in. Five thousand gallons of water rushed in on the actors. Among them was George C. Scott, who had to leave his oxygen bottle whenever he worked. A strong union guy, he refused to cross a picket line during the show. The production backed down. Another shot of the real mine. Another wing of the set. When the shooting was over people from the community asked us to please leave the set in place. (We used a large municipal warehouse for Art Department and set construction.) Production agreed. 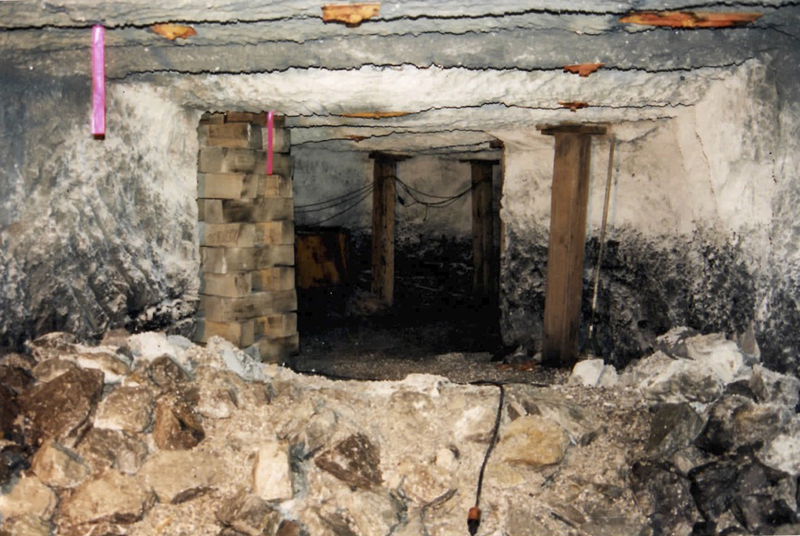 We learned that for all the generations of men that had worked the mines, the women -wives, mothers, sisters, daughters – had never seen the inside of a mine, the places where their men spent their working lives. Viewing the sets gave them some idea of their loved ones working environments. A very approximate idea, as you can tell from the pictures.